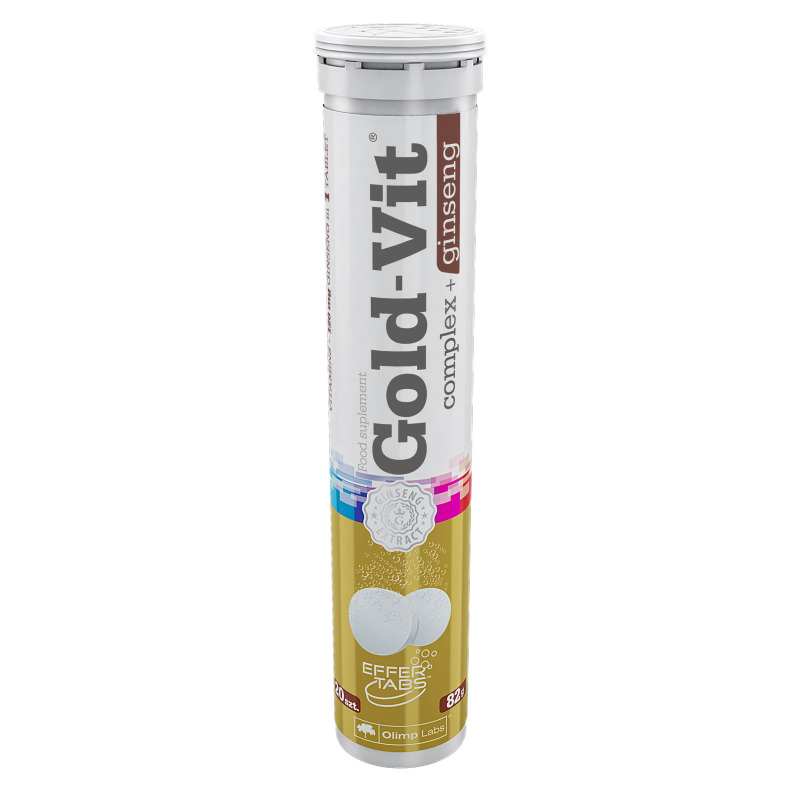 Return to Home > Pro-Gezondheid>OLIMP - GOLD-VIT COMPLEX + GINSENG [ORANGE] - 20 tab. OLIMP - GOLD-VIT COMPLEX + GINSENG [ORANGE] - 20 tab. Gold-Vit complex + Ginseng is a food supplement in the form of effervescent tablets containing a complex composition of vitamins, including vitamin B2, B6, B12, pantothenic acid with Korean Panax ginseng extract. Providing relevant portions of vitamins enhances proper processes occurring in the body. Vitamins: B2, B6, B12, pantothenic acid contribute to reducing tiredness and fatigue. In addition, vitamin B6 is responsible for proper functioning of the nervous system and maintaining psychological functions. Pantothenic acid helps to maintain mental activity at a proper level. Preparation is intended: as a food supplement for those seeking to maintain proper physical and mental activity and to reduce tiredness and fatigue, as well as a supplement of vitamins in the diet. Especially recommended for middle-aged and elderly persons, performing heavy physical and mental work and athletes. Note: the product is not recommended during pregnancy and lactation or hypersensitivity to any component. In the case of hypertension or taking medications including non-prescription medications, including: aspirin, it is recommended to consult a doctor before using the product. Ingredients: acidity regulators - citric acid, sodium carbonate; bulking agent - sorbitol, maltodextrin; vitamins (L-ascorbic acid - vitamin C, DL-alpha-tocopheryl acetate - vitamin E, niacinamide - niacin, retinyl acetate – vitamin A, calcium D-pantothenate - pantothenic acid, D-biotin - biotin, cyanocobalamin - vitamin B12, cholecalciferol - vitamin D, pteroyl-L-glutamic acid - folate, pyridoxine hydrochloride - vitamin B6, riboflavin - vitamin B2, thiamine mononitrate - vitamin B1); acidity regulator - sodium carbonate, flavours, Korean ginseng extract (Korean Panax ginseng), sweeteners - sodium cyclamate, acesulfame K; carrier (of sweetener) - polyethylene glycol, colour - beta-carotene (for orange flavor), riboflavin (for lemon flavour).